5,5 - 4,5.........Lump von Hagenstolz. 5 - 5...............Carmen vom Felsingpass. Nimrod Hilo vom Franckenhorst was a tall dog with strong bone and apart from his good head and rich tan, he was not a particularly well conformed dog. His best feature was his enormous fighting spirit and working ability. 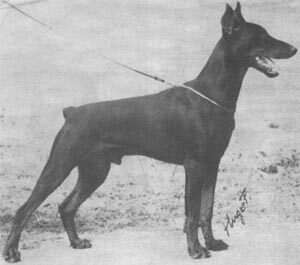 “This black male was bred in Holland by the famous vom Franckenhorst Kennel. He was not so very successful in conformation shows but as a sire he was desired. He was a strong built dog with a nice head, good dark tan and good angulation. His problem was he was a little bit overbuilt. Björn: SchH 3, Dutch Leistungssieger and passed the ZTP plus winner of numerous show championships. He is sire of the vom Wilden Markgraf “V” litter (Verry). Vitesse: SchH 1 ZTP with 1A rating for character and V for conformation plus winner of numerous show titles. She is dam of the vom Harro's Berg “A, B” litters (Arrow, Baron Bryan). Vivre Vivien: SchH 3 and dam of the vom Franckenhorst “A, B, D, G, I” litter (Dea Dolores, Graf Guido, Gringo).